September 10th, 2018, Dubai, UAE: With the focus on achieving strong mental and emotional growth among young children and toddlers, the British Orchard Nursery has organised a free interactive talk show for the parents in the UAE. Titled, “The Resilient Child”, the event will highlight ways to help children overcome obstacles, challenges and failures and adopt a more determined approach towards problem solving. The forum will be helmed by positive parenting expert and psychologist Chasity O’Connell to answer parents’ questions about their children’s mental well-being and to arm them with tools to improve their child’s problem-solving skills. The talk is scheduled for Saturday, September 15th between 3pm and 4pm at the British Orchard Nursery, Mankhool branch. The discussion is a debut event of the newly launched BON Talk Show series which will feature local and international experts who will discuss developmental goals along with the latest researched solutions on promoting child well-being. Commenting on the session, Dr Vandana Gandhi, Founder and CEO of British Orchard Nursery said: “As parents, we want our children to have the ability to face obstacles headlong at every level. But sometimes, inadvertently, we end up doing just the opposite. We have to ask ourselves why some children are far better able to counter challenges, while others are simply not able to meet them. A lot has to do with the way we react to situations and how we develop their mind-set as children learn through observation of adult behaviour. 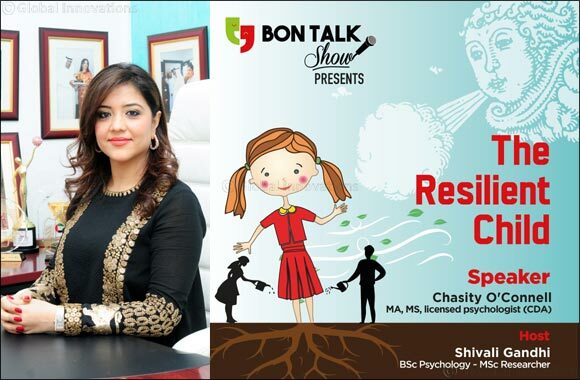 Through this interactive session at The BON Talk Show, our experts will support parents to understand the various approaches to bring up a resilient child”. British Orchard Nursery, the largest pre-school chain in the UAE, has been actively creating interactive platforms for parents while providing solutions to issues pertaining to child development with the ethos of going the extra mile to support parents.